Check out the first picture of a supermassive black hole captured by astronomers. National Science Foundation team on Wednesday evening took to Twitter to share a milestone in astrophysics – The first ever photo of a BLACK HOLE. Astronomers have taken the picture of a black hole, which is 500 million trillion km away. It was photographed by a network of eight ground-based radio telescopes. The image of a dark core bordered by a flame-orange halo of white-hot gas and plasma shows a supermassive black hole 50 million light years away in a galaxy known as M87. According to The Guardian, the breakthrough picture was captured by the Event Horizon Telescope (EHT), spanning locations from Antarctica to Spain and Chile, in an effort involving more than 200 scientists. 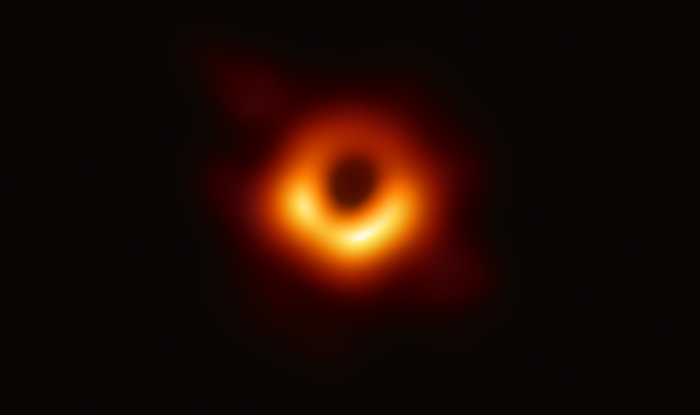 While sharing the image on Twitter, National Science Foundation’s social media team wrote, “You’re looking at the first-ever image of a black hole. It was captured by the #NSFFunded @ehtelescope project. #ehtblackhole #RealBlackHole https://www.nsf.gov/news/special_reports/blackholes/formedia.jsp …”. Black Hole is an empty space exhibiting such strong gravitational effects that not even particles or light can escape from inside it. Black holes were first predicted by Einstein’s theory which reimagined gravity as the deforming of space and time by matter and energy. The first image of a black hole confirms that Einstein’s theory of gravity is true.